Forestry remains the most important part of LULUCF – with the greatest potential as a sink but also as a major contributor to emissions. Compared to agricultural levers, forestry levers are more expensive to implement and oftentimes, in the case of developing countries, requires combatting corruption and demand for forest products. In the case of forest-related abatement levers. Forestry-related emissions are concentrated to two major emitters: Brazil and Indonesia. They account for over 50% of potential emission reductions. Established in 2005, the United Nations Reducing Emissions from Deforestation and Forest Degradation (REDD) was developed as “an effort to create a financial value for the carbon stored in forests, offering incentives for developing countries to reduce emissions from forested lands and invest in low-carbon paths to sustainable development.” The mechanism generated optimism for action in reducing emissions from forestry. In practice, however, the rollout has not been as smooth as hoped and buy-in of REDD has been mixed.33 For the purpose of our analysis, REDD (and REDD+) efforts are considered for potential implementation capacity. In addition to lack of financing and weak government capacity, pastureland conversion competes with agriculture and livestock industries. As such, we assume low potential (25%) to meet full capacity. Under the assumption of meeting 25% of full technical potential, once again, Brazil offers the greatest contribution to GHG emission reductions (0.282 GtCO2e per year by 2030, over 50% of all countries). Timber harvesting is a highly lucrative business that faces corruption, bribery of local officials and difficulty monitoring; the majority of countries will unlikely reach full technical potential for GHG emissions reduction. Under full technical potential, the African region is the greatest contributor; however, this is likely centered on the countries of CAR and the DRC, which as of late have become extremely unstable politically. An ambitious estimate of 25% full technical capacity would generate emission reductions of 0.014 GtCO2e per year by 2030 in the African region. Brazil would also offer similar levels of reductions at 0.013 GtCO2e. 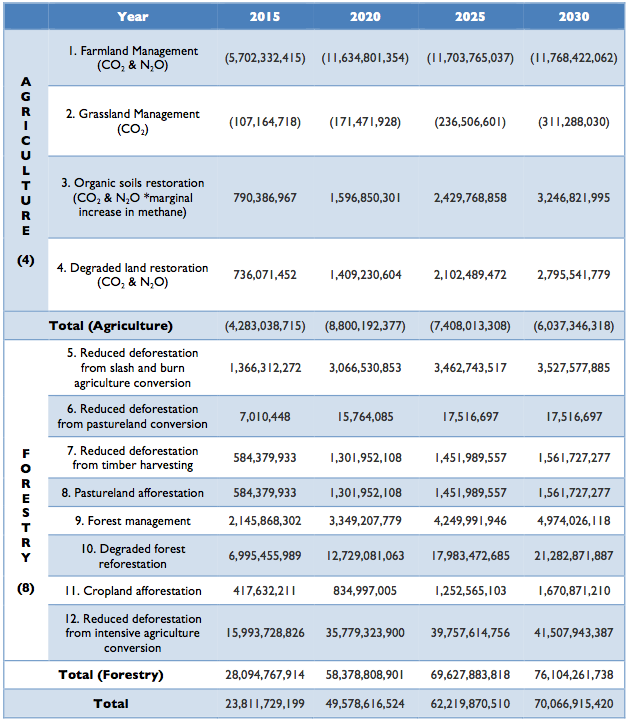 Pastureland afforestation is cheaper in Mexico, Brazil and the rest of Latin America. Therefore, analysis assumes high potential to meet full technical capacity. High costs and political instability continue to cast doubt on reaching full potential in Africa and Asia, and therefore analysis looks at 25% of full technical potential emission reductions. Once again, Brazil tops the list as highest emission reduction at 0.052 GtCO2e per year by 2030. Regions and countries facing weak governance and technical capacity (Eastern Europe, India, Latin America, China, Africa and Asia) are assumed to reach 50% of full abatement potential. Brazil, facing potential governance difficulties, was assumed to reach 75% of full potential. The biggest contributor would be in the African region (0.058 GtCO2e per year by 2030), however, political instability threatens even the ability to meet 50% of potential. As a relatively expensive measure, financing for this lever and those following will be key to achieving even partial potential. With a moderately expensive unit cost and high emissions, as well as low opportunity costs of restoring degraded forests (which cannot easily be restored for other income- generating uses such as agriculture), our model assumes full technical potential, except for Africa (due to political instability and weak governance) which is unlikely to reach full potential – instead we assume 50% of potential. In this case, the Middle East is the greatest contributor (0.386 GtCO2e per year by 2030) of emissions reduction. Due to the relative ease of restoration and potential for higher abatement, we assume, despite being energy-focused, Middle Eastern countries will be willing to finance these activities. With high costs and low yield of abatement potential, our model assumes most countries will not invest too many resources into this measure, only 25% of full potential. Like other strategies competing with agriculture, the opportunity costs are high, particularly with rising food demand. Therefore, our model assumes all countries will only meet 25% of potential. 81% of emission reductions will come from Asia and cost $9.06 billion. Again, financing will be crucial for even reaching 25% of this lever.